Four 30-foot towers bob, bow, wave and move in fluid motion, slowly undulating like blades of grass underwater. 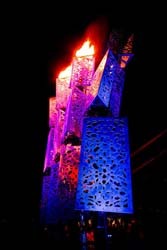 The towers are illuminated from within by full color LEDs and by fire at the apex. The sculpture waves across five thirty-foot arcs creating a ripple of fire lighting up the desert sky.. I did the structural, mechanical, and hydraulic system design. © 2015 Ray Sykes All rights reserved.